Yes, I know the season hasn’t started. 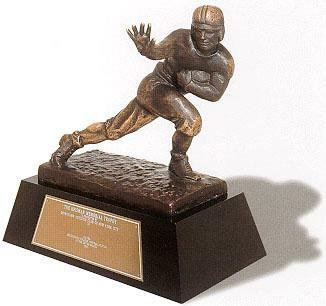 And I also understand that the last two Heisman winners came out of nowhere, but I thought it would be fun to look at some of the top players going into the 2014 season and discuss their possibility of winning the Heisman Trophy. You can’t discuss the candidates for the Heisman without starting with the 2013 winner, Florida State quarterback Jameis Winston. Winston has had his fair share of issues over the off-season, but assuming he can get his off-the-field issues taken care of, he has to be the favorite to win again. There hasn’t been a repeat winner since Archie Griffin in 1974 – 1975. If Winston is able to repeat, it will put him in rare company. The ‘Noles have a favorable schedule and many people are picking the Seminoles to repeat as National Champs. If they do that, it will be hard for the quarterback of the #1 team in the country to not win the Heisman. Oregon quarterback Marcus Mariota is one of the most talented quarterbacks in the country. Mariota leads a fast paced, quick scoring offense that can easily hang 50 points on an opponent. He has very good speed and is an underrated passer. Mariota was the #7 QB in the country in passing efficiency and threw for 31 touchdowns with only 4 interceptions while also rushing for over 700 yards and 9 touchdowns. If Oregon can win at UCLA and at home against Stanford they have a shot at the Pac-12 Championship Game which will give Mariota a good shot at winning the Heisman. Ohio State quarterback Braxton Miller reminds me a bit of former Texas quarterback Vince Young. When Miller first came to the Buckeyes, he was almost completely a running QB, but his passing stats have improved with each year of experience. His completion percentage has progressed from 54.1% his freshman season to 63.5% last year. With three years under his belt, I expect his senior season to be his best ever. Miller is a tough player that runs with power, however, at times he tends to take shots and gets nicked up. Miller missed two games last year, but if he can stay healthy, the Buckeyes have a very good shot at winning the Big Ten championship and getting into the first round of the playoffs. Yes, I said playoffs, isn’t that music to your ears? If the Buckeyes can come out of the Big Ten undefeated, then Miller may be a finalist to go to New York. Who would have thought that the 2013 Auburn Tigers would win the SEC Championship and have a shot at a National Championship? I sure didn’t! Part of the success of the Tigers was the play of quarterback Nick Marshall. Marshall is a better runner than passer, but he is a magician at running the Tigers option attack. When the defense begins to crowd the line of scrimmage, Marshall has just enough passing skill to make them pay by getting the ball behind them. Last year was Marshall’s first year in the system, so I look for him to be even better this year. Marshall has had issues over the off-season, so he will need to put those issues behind him. If Auburn can have anywhere near the same season as 2013, then Marshall is a contender to take home the hardware. Georgia running back Todd Gurley is the first running back on our list. Georgia Head Coach Mark Richt has always been a fan of running the ball and after losing four year starter Aaron Murray to the pros, I expect Richt to run the ball even more. Gurley is a rare combination of size and speed. Although the Bulldogs also have Keith Marshall, Gurley is the lead back and gets the majority of the carries. Gurley missed three games last year due to injury, so he will need to stay healthy to have a chance at winning. Robert Griffin III, Nick Florence, now Bryce Petty. It seems like whoever the Baylor Bears quarterback is, they flourish under Coach Art Briles’ system. RG3 won a Heisman in this system, so you can’t count out Petty. This will be Petty’s second year in the system, so you would think his stats would be even better in 2014. Last year, Petty completed 62% of his passes and threw for 32 touchdowns with only 3 interceptions. He led his team to an 11-1 record before losing to Central Florida in the Fiesta Bowl. If Baylor can survive a November schedule of road games in Norman, Oklahoma and home games against the Oklahoma State Cowboys, Texas Tech Red Raiders and Kansas State Wildcats, then Petty should have a chance at taking home the trophy. The UCLA Bruins became a better team once Brett Hundley took over as the quarterback. Hundley is an athletic quarterback that threw for over 3,000 yards and rushed for over 700 yards. Hundley is still raw and tends to throw more interceptions than you would like, but the Bruins have a favorable schedule with home games against Oregon, USC and Stanford. Because of the schedule, UCLA has a good chance at making the Pac-12 Championship Game and possibly a playoff berth which would give Hundley a shot at winning the award. Wisconsin running back Melvin Gordon shared carries with James White in 2013, however Gordon still rushed for over 1,600 yards and 12 touchdowns. White has moved on to the NFL, so Gordon will be “the guy” this year for Wisconsin. Gordon will need to work on his conditioning because he wore down toward the end of 2013. He rushed for over 100 yards in six of his first seven games, but only once in the last six. The Badgers have a good shot at winning the Big Ten West which would put them in the Big Ten Championship Game. If Gordon has a big year and the team is able to win the Big Ten Championship, then Gordon has a shot at winning the Heisman. South Carolina Head Coach Steve Spurrier has abandoned the Fun-N-Gun for the Ground-N-Pound in recent years. Running back Mike Davis could be the beneficiary of that approach this year. Davis was injured for parts of two games last year, but still rushed for over 1,100 yards and 11 touchdowns. He also showed off his receiving skills with 34 receptions. Now that quarterback Connor Shaw has graduated, the Gamecocks will go with Dylan Thompson as the quarterback. Thompson is more of a drop back passer than Shaw, but I still look for the Gamecocks offense to go through Davis. For Davis to have a shot at the Heisman, his team will likely have to beat out Georgia in the SEC East and make it to the SEC Championship Game. I’ll end my article with a sleeper. LSU true freshman running back Leonard Fournette was the most highly touted freshman in the 2014 class. Fournette is a very highly touted 226 pound running back that should have a good chance at becoming the starter since Jeremy Hill and Alfred Blue have gone on to the NFL. His main competition for playing time are Kenny Hilliard and Terrence Magee. LSU Head Coach Les Miles claims that Fournette is either the fastest or second fastest player on the team. Considering that quarterback Zach Mettenberger has also graduated, it makes sense that the Tigers may have to lean hard on the running game and I expect Fournette to benefit from that. This concludes our preseason Heisman Watch. If you like what you read, please like us on Facebook and recommend us to your friends. See you next Wednesday! This entry was posted on August 6, 2014 by draftmaniacs in Uncategorized and tagged 2014 Heisman Trophy, Braxton Miller, Brett Hundley, Bryce Petty, Heisman Trophy, Jameis Winston, Leonard Fournette, Marcus Mariota, Melvin Gordon, Mike Davis, Nick Marshall, Todd Gurley.